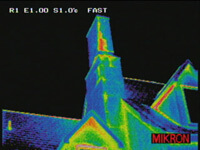 Infrared Thermography, Thermal Imaging, and Thermal Video are examples of Infrared Imaging Science. Thermal Imaging Cameras detect radiation in the Infrared range of the electromagnetic spectrum (roughly 9,000–14,000 nanometers or 9–14 µm) and produce images of that radiation, called thermograms. Since infrared radiation is emitted by all objects above absolute zero according to the black body radiation law, thermography makes it possible to see one’s environment with or without visible illumination. The amount of radiation emitted by an object increases with temperature; therefore, thermography allows one to see variations in temperature. When viewed through a thermal imaging camera, warm objects stand out well against cooler backgrounds; humans and other warm-blooded animals become easily visible against the environment, day or night. Thermography has a long history, although its use has increased dramatically with the commercial and industrial applications of the past fifty years. Maintenance technicians use thermography to locate overheating joints and sections of power lines, which are a sign of impending failure. Building construction technicians can see thermal signatures that indicate heat leaks in faulty thermal insulation and can use the results to improve the efficiency of heating and air-conditioning units. Infrared Thermography is a non-contact, non-destructive method of testing that can be performed remotely while measuring and recording temperature data.